This manual describes the Nagios add-on script pnp4n_send_service_mail.pl. Its purpose is to handle the Nagios service e-mail notifications. After receiving the Nagios service state information, it formats the e-mail according to various flags and sends the notification through an SMTP gateway. 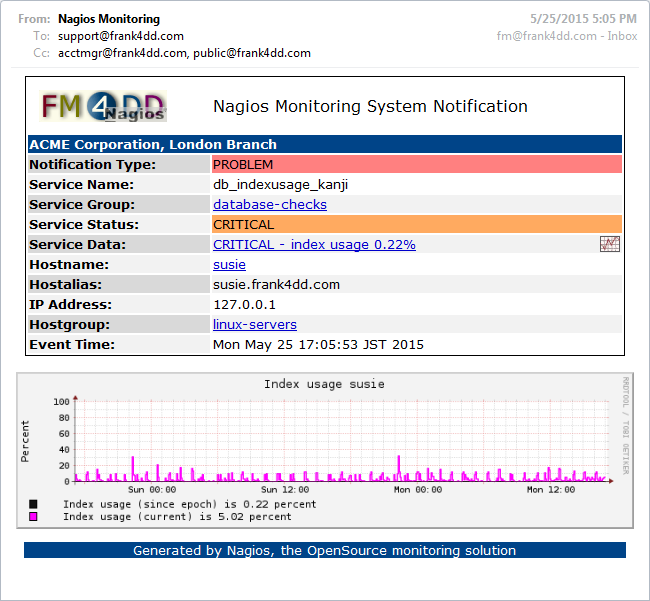 As a unique feature, it implements the inclusion of service-specific performance graphs from the Nagios graphing package PNP4Nagios, enhancing the information value of an Nagios e-mail alert. Use $CONTACTGROUPMEMBERS$ instead of -r (--to_recipient). This will create a list of contactgroup members. Their complete the mail address with the hard defined $domain in this script. This is only possible when the contact name "abcd" works under the address "abcd@domain". the prefered e-mail language. The content-type header has been hard-coded to UTF-8. This might need to be changed if recipients require a different characterset encoding. It is easy to define additional languages inside the script. Currently the script supports the following languages: English, Japanese, French and German. First, copy the downloaded script into a suitable Nagios location. Good places are the Nagios program directory nagios/bin, or the Nagios plugin directory nagios/lib. The scripts need to be executable by Nagios. # graphs we need to set a valid host name and service name below. # image generation. Modified by Robert Becht for use with PNP4Nagios. # given, we use the provided value in $o_smtphost below as the default. # If the mailserver requires auth, an example is further down the code. # PNG file, i.e. the nagios logo. Best size is rectangular up to 160x80px. In most cases, the web access to PNP4Nagios will be protected through user authentication. Either we configure a web user and password within the notification script, or we disable the webserver authentication to PNP4Nagios for our script access. This is fairly safe, since the script will always connect from our trusted localhost (127.0.0.1). Now we can try and run the script from hand. For easy troubleshooting, the script provides a test option -t, and in combination with the verbose -v option, many issues can be identified right away. main: trying to create the a PNP4Nagios graph image. main: Sending HTML email (language: en) with inline logo. The example output above shows what happens if the web authentication prevents our script from getting the graph image. Here we receive a HTTP error code "401 Authorization Required", and instead of the beautiful graph, an empty 1x1 pixel image is used. If you see this error, it typically is a problem with the web username, password, or the webserver auth domain name. Either correct the web authentication settings in the scripts top section as shown below, or create the mentioned webserver authentication exception for localhost as shown further up on this page. main: Converted inline logo to base64 and set type to gif. After checking the mailbox to verify the e-mail arrived and is complete, we can proceed by configuring Nagios to use the new notification script. Next we define how Nagios calls the notification scripts. Below is an example of the notification definition in the Nagios command.cfg file. I typically move all notification commands into its own configuration file notifications.cfg (example). Depending on the type of e-mail you want to generate, you might want to select different script options. Reloading Nagios should enable the new notifications. Now we can manually generate a test message from Nagios, using the "Send custom service notification" command. By including the keyword email-debug into the comment field, the script will create additional debug output into the e-mail itself. Another way to troubleshoot potential issues is to call the script from Nagios with the verbose -v option, and redirect the output into a log file. This way, we can capture possible problems with variable content coming from the Nagios environment. If all is well, we should be able to get Notifications as seen in the following example screenshots. In the following example screenshots, I used the operating systems memory check to demonstrate how a message would look in various configurations. First, the notification script with its most basic plaintext notification. The language has been set to French. Second is an example notification using the -f html and -u options, formatting the content as HTML with links to Nagios. The language has been set to Japanese. pnp4n_send_service_mail.pl is able to pick up the on-the-fly generated graph image generated by PNP4Nagios. This works with PNP4Nagios version 0.6.17 and possibly also with other versions. If no graphing package is available, then it is best to only use this script's notification formats 'text', 'html' and 'multi'. The PNP4Nagios notification consists of a pair of scripts. This script is dedicated for Nagios service notifications. For host notifications, a separate script, pnp4n_send_host_mail.pl has been created. It can be downloaded here. The original idea for the scripts, and their first implementation was done during the New Years holidays 2010/2011. These original scripts   were developed for the Nagiosgraph package. Unlike those, the pnp4n notification scripts do not generate the graph image from the RRD database, but fetch them through the web interface. The unnecessary overhead of making a web request is not ideal, but unfortunately PNP4Nagios uses a special framework (Kohana), which does not expose any functions to commandline access. Additional reverse-engineering would be necessary to re-create the graph images in the same beautiful way of PNP4Nagios. Besides overhead, another drawback of the current method is the adjustment of the image size between the PNP4Nagios web interface and the typically smaller size preferred for e-mails. Icinga: Although this manual only mentions Nagios, the scripts are reported to work with Icinga after minor changes. Replace all instances of 'nagios' in the script, make sure to take care of the case. Run a find and replace on 'nagios', 'Nagios' and 'NAGIOS' and replace with 'icinga', 'Icinga' and 'ICINGA'. Give it a try. This script would not exist but for the considerable contribution of Robert Becht. Introducing a number of improvements, such as extensible multi-language support, contact group mailing, raw code for PNP4Nagios image fetching, and and others. His dedication to programming, testing and answering questions made it largely possible. Also thanks to the community, the demand for a solution covering PNP4Nagios was constantly there, and the appreciation and encouragement kept the efforts going. nagios_send_host_mail.pl - The Nagios monitoring script for hosts and Nagiosgraph can be found here: nagios_send_host_mail manual.